Waikoloa Fairway Villa K31 with Lake Views, and 2 bedrooms. 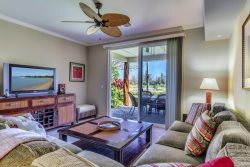 Waikoloa Fairway Villa K31 is a spectacular two bedroom, two bathroom penthouse with gorgeous sunset lake views. Close to the ocean in a perfect location immediately next to the pool and resort facilities overlooking the lights of the Kings Shops reflected off the lake in front of your lanai. The living area is furnished in upscale tropical décor and opens onto the lanai overlooking beautiful Kings Lake. This creates a very spacious and private feel to your villa. Enjoying your morning coffee or an evening cocktail on the lanai may become a highlight of your visit while you enjoy the palms swaying and the birds singing! The master bedroom suite features a Tommy Bahama King bed, ceiling fan, dual sinks, a separate soaking tub, glass enclosed shower and walk-in closet. The second bedroom offers two twin beds and is near the main bathroom. Also included; basic cookware, dishware, drinkware, coffee maker, blender, washer/dryer, hairdryer, bed and bath linens, iron, air-conditioning, wireless service, basic cable TV. There is plenty of beach gear like chairs, boogie boards, cooler and umbrella as well as beach towels for your use. There is a swimming pool and hot tub, fitness room, and BBQ grills located at the pool. Waikoloa Fairway Villa is just a short stroll down the path over to the Kings’ Shops or the Queens’ Marketplace for shopping, dining, entertainment, and services. Anaeho’omalu Bay, also known as A-Bay, is a ten-minute walk or a three-minute drive from your front door and is great for swimming, snorkeling, and sunning. Enjoy the spas and restaurants at the Marriott. Visit the dolphins and take a tram to the shops and restaurants of the Hilton. Experience a luau and enjoy the sunset over the ocean. Play golf on world class courses. There are so many opportunities here and there is something for everyone! Please note: Per the HOA rules at Waikoloa Fairway Villas, children under the age of 12 are not allowed in or around the spa/hot tub area. All have always been more than professional, pleasant, and easy to work with. Ann Marie Moynahan made booking very easy. All her communications were so friendly and polite! Also, after our visit I was very impressed with the professional and honest way your staff dealt with inquiring if we had left behind some valuables. I appreciated being contacted! K-31 is an absolute treasure I would love to keep to myself, because its popularity might makes it less available. I will definitely return with my family to enjoy this perfect location. Our guests were thrilled with their room too! They appreciated that the twin beds converted to a king sized bed. The ingenious strapping and padding made the sleeping so comfortable that they purchased the same system to use with their own guest room at home. Everyone who has vacationed on Hawaii has told us it was the best vacation of their lives. We needed to confirm that for ourselves. My husband and I agree! It was the best vacation we have ever had! We enjoy relaxing on the beach and snorkeling but dislike hot hot temperatures. There are so many good beaches along the western coast! The temperature on Hawaii was ideal! We are not fond of crowded cities but love to shop so the location of the Waikoloa Fairway Villa was perfect in every way!